The NEW EC-1A-RS model is designed for large loads from 4A to 3kA, if you require higher inputs, 5kA or 10kA, please let us know. The Rogowski Coil fits around cables of 140mm diameter or less. Note, the Rogowski Coil breaks open at the black joint, allowing them to be placed around the cables withouthaving to break the main circuit. The new Range Select button allows youto choose between two measurement ranges 4A to 400A or 20A to 3kA per phase. The EC-1A-RS uses USB communications. For lower currents between 0.5A and 400A we recommend the new dual range CT-3A-RS which uses traditional clamp-on current transformers (CT's) and has a maximum input of 400A per channel, making it accurate at lower currents, suitable for domestic and light commercial logging. For higher industrial loads between 400A and 3kA we recommend the EC-7VAR Power Logger. 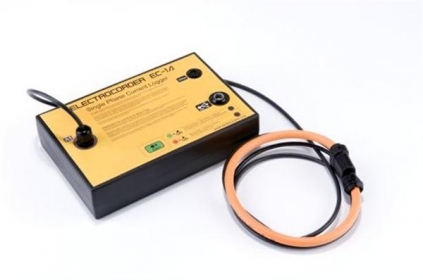 The advantage of the Electrocorder products over most others is that our data loggers constantly sample information (recording the Min, Max and Average) overthe set period, many other products only take 'snap shots' of what is going onand can miss 99.9% of the data that is critical to your analysis. Set includes data logger, Rogoswski Coil, USB lead, Electrosoftsoftware and a carry case. Current Input socket types (all channels): Hard-wired through cable glands. power distribution companies, facilities management, power management and optimisation companies to monitor loads from 5A to 10kA.